The Judaean Mountains, or Judaean Hills (Hebrew: הרי יהודה Harei Yehuda, Arabic: جبال الخليل‎ Jibal Al Khalil), is a mountain range in Israel and the West Bank where Jerusalem and several other biblical cities are located. The mountains reach a height of 1,026 metres (3,366 ft). The Judean Mountains can be separated to a number of sub-regions, including the Mount Hebron ridge, the Jerusalem ridge and the Judean slopes. These mountains formed the heartland of the Kingdom of Judah, where the earliest Jewish settlements emerged. The range runs in a north-south direction from Galilee to the Negev with an average height of 900 metres (2,953 ft). The Judaean mountains encompass Ramallah, Jerusalem, Bethlehem and Hebron. 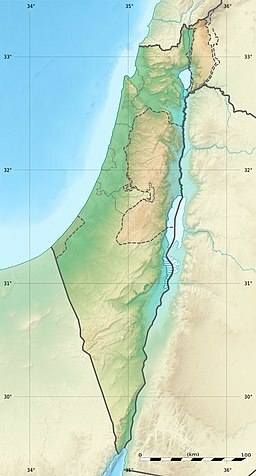 The range forms a natural division between the low Shephelah hills and the coastal plain to the west, and the Jordan Rift Valley to the east. North of it lie the Samarian Hills, to which it connects along the Ramallah line; the middle section is referred to as Jerusalem Hills, and the southern one as Hebron Hills, which reach south to the Beersheba-Arad valley. The Judaean Mountains were heavily forested in antiquity. The range is mostly composed of terra rossa soils over hard limestones. The Judaean Mountains are the surface expression of a series of monoclinic folds which trend north-northwest through Israel. The folding is the central expression of the Syrian Arc belt of anticlinal folding that began in the Late Cretaceous Period in northeast Africa and southwest Asia. The Syrian Arc extends east-northeast across the Sinai, turns north-northeast through Israel and continues the east-northeast trend into Syria. The Israeli segment parallels the Dead Sea Transform which lies just to the east. The uplift events that created the mountain occurred in two phases one in the Late Eocene-Early Oligocene and second in the Early Miocene. In prehistoric times, animals no longer found in the Levant region were found here, including elephants, rhinoceri, giraffes and wild Asian water buffalo. The range has karst topography including a stalactite cave in Nahal Sorek National Park between Jerusalem and Beit Shemesh and the area surrounding Ofra, where fossils of prehistoric flora and fauna were found. In ancient times the Judean mountains were the allotment of the Tribe of Judah and the heartland of the former Kingdom of Judah. An Israel Railways line runs from Beit Shemesh along the Brook of Sorek and Valley of Rephaim into Jerusalem Malha Train Station. ^ a b c Peter N. Peregrine, Melvin Ember, ed. (2003-03-31). Encyclopedia of Prehistory: South and Southwest Asia. 8. ISBN 9780306462627. Retrieved 2012-02-13. ^ Arieh Singer (2007). The Soils of Israel. Springer. pp. 129, 143. ^ Flexer A (1989). "Late Cretaceous evolution of the Judean Mountains as indicated by ostracodes". Terra Nova. 1 (4): 349–358. doi:10.1111/j.1365-3121.1989.tb00385.x. ^ Bar, Oded; Zilberman, Ezra; Feinstein, Shimon; Calvo, Ran; Gvirtzman, Zohan (2016). "The uplift history of the Arabian Plateau as inferred from geomorphologic analysis of its northwestern edge". Tectonophysics. 671: 9–23. doi:10.1016/j.tecto.2016.01.004. ^ "History of Jerusalem from Its Beginning to David". Biu.ac.il. 1997-03-06. Retrieved 2012-02-13. ^ "Cambridge History of Judaism". Cambridge.org. p. 210. Retrieved 16 August 2011. "In both the Idumaean and the Ituraean alliances, and in the annexation of Samaria, the Judaeans had taken the leading role. They retained it. The whole political–military–religious league that now united the hill country of Palestine from Dan to Beersheba, whatever it called itself, was directed by, and soon came to be called by others, 'the Ioudaioi'"
^ A History of the Jewish People, edited by Haim Hillel Ben-Sasson, page 226, "The name Judea no longer referred only to...."
Wikivoyage has a travel guide for Judaean Mountains.